At B&P Water Technologies, we design and manufacture high quality reverse osmosis desalination plants. All of our units are completely tested and assembled, so there's no need for further assembly works. We build seawater reverse osmosis plants inside metal shipping containers - making transportation and delivery as safe and reliable as possible. We include everything needed for seawater reverse osmosis in all of our plants, including pre-treatment, reverse osmosis membranes, electrical equipment and control components. An optimal water desalination process is the perfect combination of technologies and labor, to have the most interesting production costs and the highest quality. At a time when environmental health and energy savings are so important, we choose the most advanced devices, in order to minimize operation costs and respect the planet. 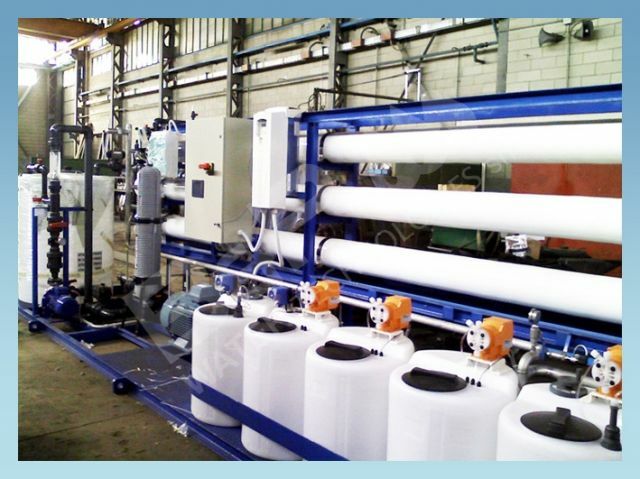 Fully automated and easy to use, our desalination equipment is made with the highest quality materials available. This ensures that essential maintenance and repairs are kept to a minimum. We manufacture high pressure seawater pipes with Duplex stainless steel, and low pressure pipes with atoxic PVC - ensuring optimum performance in all conditions. We address to cruise lines, hotels, marina and offshore platforms. Our reverse osmosis plant disinfects seawater through a process of ultraviolet sterilisation, so you won't need to use potentially caustic agents such as sodium hypochlorite. And the system is manufactured with durable materials like Duplex SS, PVC, HDPE or Polypropylene - making it suitable for long-term use in seawater. The seawater filtration process involves two separate steps. Water is first filtered through sand, and is then subjected to micrometric filtration to ensure all solid particles are removed. This two-step process prolongs the life of the plant's membranes. At B&P Water Technologies we work with our clients to customise all of our standard equipment for specific tasks and environments. We can make changes to components and accessories based on the exact nature of the desalination process.